Jack (Nicholas Hoult), desperate for money, goes to town to sell his horse and cart. After a monk (Simon Lowe) steals some ancient relics from Roderick (Stanley Tucci), the castle is locked down. The monk gives Jack a the relics as collateral for the horse, so he can escape. The relics are beans that grow a beanstalk to the land of giants that exists between Heaven and Earth. When one of the beans gets wet, the beanstalk shoots Jack’s house into the sky, with Isabelle (Eleanor Tomlinson), King Brahmwell’s (Ian McShane) daughter, up to the land of the giants. The king sends his soldiers, led by Elmont (Ewan McGregor), along with Jack and Roderick, to retrieve his daughter before any harm can come to her. The giants are angry at having been trapped in their land, after having attacked the kingdom during a previous visit to Earth. They are anxious to get back to Earth to seek revenge. The other relic the monk was not able to steal from Roderick is a crown that makes the giants do the bidding of whoever is wields it. Roderick brings the crown with him to command the army of giants and take over the kingdom. Jack and Elmont must stop Roderick and the giants before they can take over. 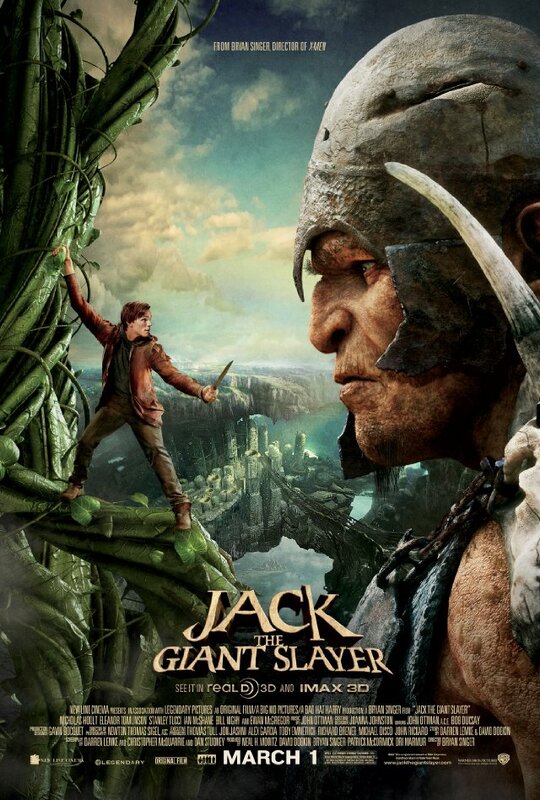 Jack the Giant Slayer is a departure from the fairy tale we all grew up with. Sure, the basic idea is the same, with a beanstalk that takes Jack to a land of Giants. But that is where the similarities end, at least as far as I remember it. The movie starts out with Isabelle and Jack being read the story of the giants attacking the kingdom by their respective parents. The animation during these story times/flashbacks is very video game like. This put me off a little from the start. I was hoping all the CGI would not be done this way. (The woman at the store I rented it from had mentioned that some people complained about the CGI on the giants. If this is how it was going to be, I could understand why.) Luckily, once we move to the actual story, the CGI gets much better. The giants are done about as well as they can be done. I have no complaints, after the initial storytelling portion. This movie goes along with the slew of other fairy tale movies that have come out of late. They are darker than what you learned as kids, probably more in line with the original Grimm’s Fairy Tales as they were written. This one doesn’t get as graphic as, say, Hansel & Gretel: Witch Hunters. It keeps things on a level that it can tell the story it wants to tell, but still watchable for kids. Stanley Tucci plays a great villain. He always does. And it is hard to go wrong with Ewan McGregor on board. Everyone else does an acceptable job, given it’s a fairy tale film. Jack is an entertaining movie for the genre. It’s predictable, but that can be overlooked. If you get the chance to watch it in 3D, the effects are well done. Not overly gratuitous, but they add enough to make it fun. If you’re watching it the way most will, it is still worth seeing. Overall, not a bad choice for a family movie night.